Carl Zeiss SEM develops a wide range of microscopes from traditional to the most powerful electron microscopes. 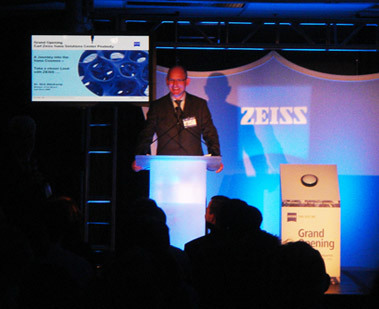 Zeiss contracted TR Design to produce a ribbon-cutting event for the grand opening of their North American headquarters in Peabody, Massachusetts. The company wanted to attract a large audience of customers, local politicians and dignitaries, and to make this a truly memorable event. They had the beginnings of a theme —“A Journey into the Nano Cosmos”— and asked TR Design to refine the theme, provide all of the necessary creative and produce the event. We created the theme “A journey into the nano-cosmos. Take a closer look with Zeiss.” and transformed the company’s new headquarters into a “Nano Cosmos” for this important and memorable event. To make a big impression on visiting customers, media, and politicians, we transformed the company’s single-story industrial building into a futuristic venue where we led guests on a journey into the Nano Cosmos. Create a memorable event in a one-of-a-kind space. We transformed the company’s manufacturing floor into an other-worldy space for the opening ceremonies, and the hallways leading to the presentation area were awash in Zeiss blue, making it clear that this event was not a traditional opening. We branded the event, and produced a dynamic set of videos to serve as the event opener for the official ribbon cutting. 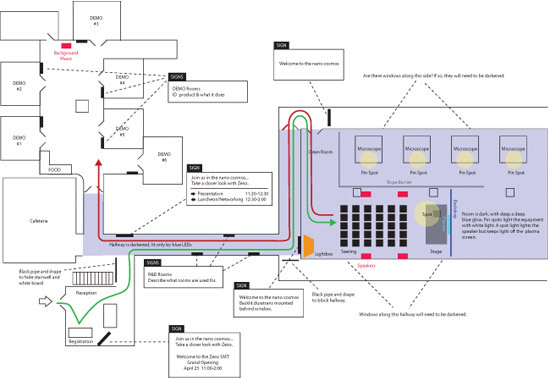 Direct all vendors to ensure a successful event. We worked with the client’s AV company to create the event we had conceived, and introduced our event management partner to handle media relations and to manage catering. We secured talent to serve as the MC, the same actor we had used in the familiar ORION launch video we produced for Zeiss. This video was created to open the ceremonies. 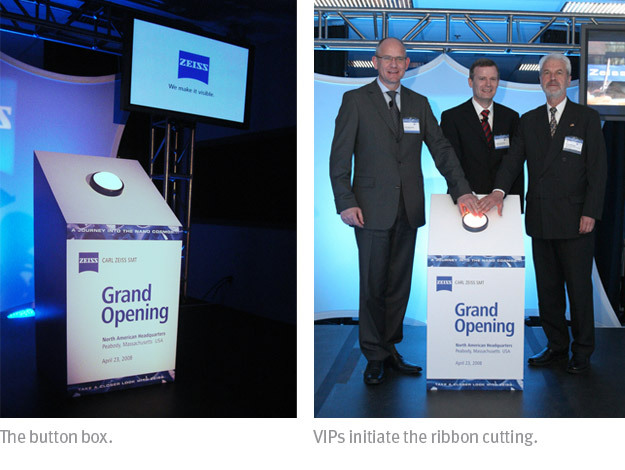 The client did not want a traditional ribbon cutting so this video was launched by dignitaries pushing a large, lighted button (shown above). With the success of the ORION product launch that we produced for Zeiss, they turned to us to produce the grand opening ceremony for their North American headquarters. The concept was inspired by the term they had coined, “The Nano Cosmos”. This effort is a good example of how we are sometimes asked to start with the kernel of an idea that a client has developed. 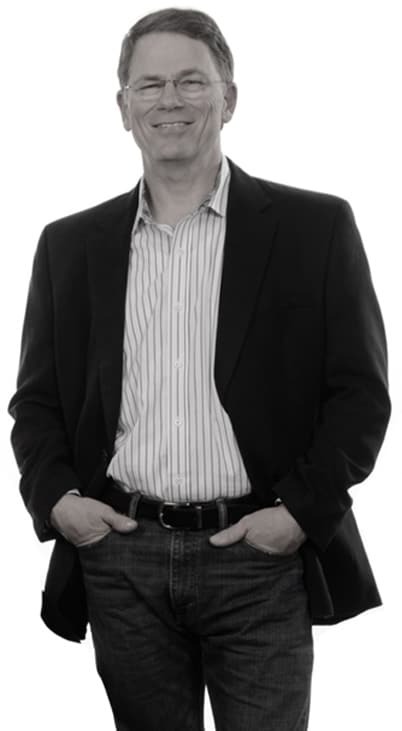 Where many design firms would discount a client’s input, we relish the challenge of incorporating ideas from wherever they derive, marrying them to our creative and turning it into something special.